Hino has hosted the Australian commercial vehicle media to the local launch of its new Standard cab 500 series medium duty range which was held late last week in Canberra. Truck and Bus News attended the launch and got a better feel for the truck in liocal conditions and with local spec. 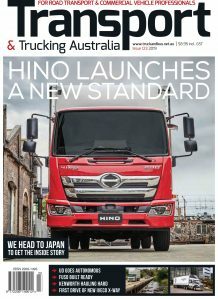 Despite having a preview of Hino’s new Standard Cab 500 series range in Japan last November driving the trucks on local soil and in real world conditions rather than the brief test track preview we had in Japan gave a better insight into the strategy Hino is adopting and how the trucks perform on Aussie roads. The big factor, as signalled in the trip to Japan is Hino’s strategy of offering the full suite of safety and crash mitigation systems targeting the increasing OH&S demands. Hino is claiming it is offering class-leading features including Pre-Collision System, Vehicle Stability Control and cleaner emissions and is already selling the new truck with early indications showing the new truck has given the company a sales boost already. “The level of safety on this truck has never been seen before in a Japanese-built medium duty truck in Australia – this is complemented by the superior torque, increased power and reduced fuel consumption of the all-new heavy-duty Hino A05 turbo charged five litre four-cylinder diesel engine,” said Hino Australia’s manager of product strategy, Daniel Petrovski. Hino says the 500 Series Standard Cab boasts the most comprehensive active safety package ever offered by a Japanese manufacturer in the Australian medium duty truck market. As already mentioned the headline act is the Pre-Collision System (PCS) which includes Autonomous Emergency Braking (AEB), Pedestrian Detection (PD) and Safety Eye (SE). Journos had a taste of how the system worked on the Sutton Rd Driver Training track with driver trainer and motor sport luminary Rick Bates. Sitting in a Hino crew cab 500 on cruise control at 35km/h the truck approached a cardboard cut out image of the rear of a car. The system pulled the truck up safely and without collision and without Bates touching the brakes. It was all managed by the PCS system. Hino is at pains to point out that the system is a crash mitigation system and will not always be able to avoid a collision, particularly at higher speeds but rather to minimise the speed and damage in a crash and to hopefully also avoid the hit as well. Hino is also offering Adaptive Cruise Control and a Lane Departure Warning System as standard. Hino is also the first among the Japanese medium duty makers to offer standard inclusion of Vehicle Stability Control (VSC), incorporating Anti-Lock Braking System (ABS) and traction control. This makes Hino the only Japanese manufacturer to offer VSC as standard equipment on every on-road model in its light and medium range, from the 300 Series light duty car licence through to the 500 Series 6×4 350 horsepower FM models. Further in-built safety technology includes a standard reverse camera with infra-red night vision capability and a microphone. We were given the opportunity to test the VSC system on the skid pan at Sutton Rd sliding a tipper bodied 500 around the track before switching on the VSC and having the truck ‘manage’ the slides and stablise the truck to negate out of control manoeuvres. Very impressive indeed. Powering the new 500 Series Standard Cab is the new A05 turbo charged five litre four-cylinder diesel, delivering better torque, power and reduced fuel consumption, along with what Hino claims is the cleanest exhaust emissions ever for a Hino truck in Australia. The A05 is derived from the larger A09 six cylinder heavy duty engine fitted to the 700 Series heavy duty models in Japan as well as the medium and heavy duty 500 Series Wide Cab models already launched in Australia. The new engine is being offered in three power ratings dependant on model selected – the FC 1124 & FD 1124 models are fitted with the A05-TE engine, which delivers 240hp at 2300rpm and 794Nm of torque at 1400rpm. FE 1424 crew models receive the A05-TD also with 240hp at 2300rpm but with increased torque at 833Nm at 1400rpm, while the FD 1126 and FE 1426 models receive the A05C-TC with peak power of 260hp at 2300rpm and torque of 882Nm at 1400rpm. Notably the 500 Series Standard Cab is the first Japanese medium duty truck range in Australia below 15 tonne GVM to be fitted with a true engine brake. “This means that medium duty market customers can now benefit from the improved drivability and operational efficiency that the Jake brake (Jacobs Engine Brake) can deliver,” said Mr Petrovski. And has also confirmed the Australian truck market trend towards automatic transmissions, with a six-speed Allison 2500 Series full automatic transmission now available across the entire 500 Series Standard Cab range of cab chassis vehicles,” said Petrovski. Manual shifters continue to be available widely across the range with the excellent Hino LX06 and the new MX06 six-speed manual gearboxes fitted to FC and FD 1124 and FD 1126 models respectively, while the FE 1426 models are equipped with the even better new MX07 seven-speed manual gearbox which offers an additional gear and wider ratio spread than its Japanese rivals. FD and FE customers also have the option of a Hino Automated Manual Transmission (AMT), in the MX06 six and MX07 seven speed respectively. Hino says customers can choose from 54 different vehicle specifications across the 500 Series Standard Cab range of FC, FD and FE models. There is a plethora of models, too many to mention here with combinations of cabs including short cab, rest cab with an ADR42 compliant sleeper and a crew cab, with an equally large variety of chassis lengths and GVMs to choose from. First thing that you notice when climbing into the cab of the new Hino is the striking new exterior and interior design incorporating a series of features that ‘raise the bar for style and comfort’ in the medium-duty truck segment. The new interior features an ergonomically-designed dash layout with a new smart Multimedia touch screen system, all-new instrumentation and a larger LCD Multi-Information Display. “The interior is quite unique in the Australian truck landscape, with increased day-to-day functionality, practicality and comfort, all set in a balance of carbon, silver and earthy tones,” said Daniel Petrovski. 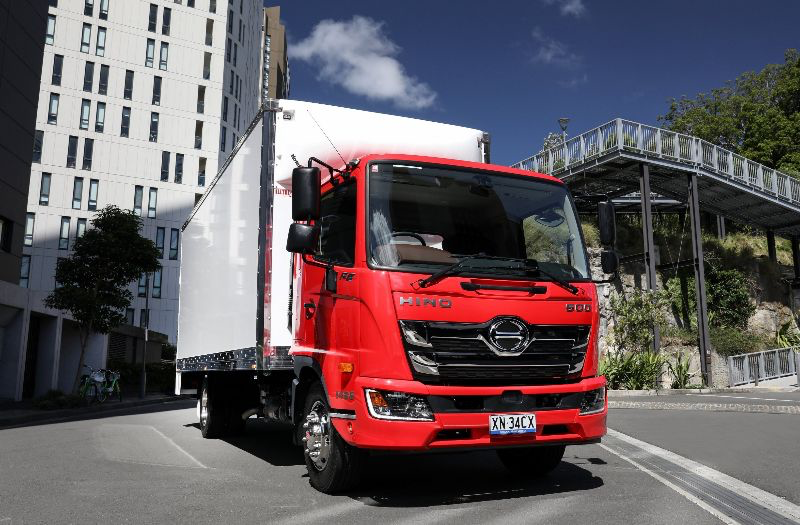 Hino Australia’s all-new 500 Series Standard Cab has a dynamic new face with a stylish two bar grille and an enlarged Hino badge while headlamps with integrated indicators are set in the bumper. Both the FD and FE models receive LED headlamps, daytime running lamps and fog lamps. Another first for medium duty Japanese-built trucks in Australia is the multi-function steering wheel, with its rotary switch on the left providing fingertip control of the Multi-Information Display, and its right hand rotary switch controlling the settings for the Adaptive Cruise Control. Automated manual transmission models benefit from a new rotary gear selector on the dash that toggles between Drive, Neutral & Reverse, and gear selections can also be controlled manually via a gear selector paddle on the steering column. Available for the first time in a Japanese truck is the ISRI NTS2 driver’s seat, which is the newest version of ISRI`s popular 6860 / 870 drivers suspension seat. All in all an impressive new truck range and we will have further reports and test drives over the next few months as we get a chance to drive other models on extended drives.